Many people are turning to entrepreneurship and small businesses in the 21st century as a way to add additional income to their main source, or as an attempt to transition away from the corporate world into something they are truly passionate about. Running a business from your home, or renting office space, comes with a wide range of complications, especially as your business begins to grow and you find yourself with constantly changing requirements. Below are some of the ways that a storage space can help you grow your business and take it to the next level. Many of your clients, especially if you manufacture or ship things, are going to want to know that what they are buying from you is well protected. If you are storing everything in your home or unsecured office space, it appears unprofessional, and there is a good chance that some people, especially if the items are unique and fragile, are going to feel like their purchases could be lost or damaged. Storage space can provide current and prospective clients with peace of mind that what they are buying is well protected. 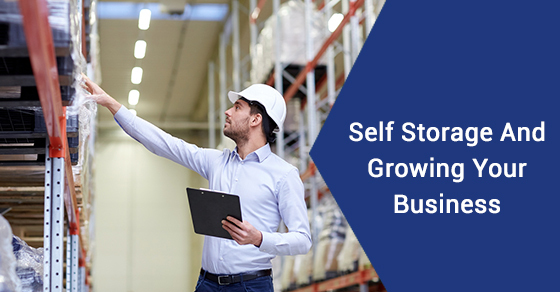 As your business and customer base grows, the amount of inventory that you will start keeping on hand is probably going to rise as well. If you are unwilling to leave your home or the small office space you are renting, your growth might end up being constrained by the amount of space you have on hand to store everything. Self storage is a great way to free up office space for actual work. As your business grows and your space requirements expand, if you are working out of an office space outside your home, the cost of renting, leasing, or owning more space could be very expensive. A self storage unit is affordable and secure, and can help you add additional space to your operations without breaking the bank. One of the great things about most self storage facilities is the flexibility of their contracts. You are able to increase and decrease the size of your space as your needs change. Business ebbs and flows, and needs change with the tide. If you all of a sudden need a bigger space and then six months later need to transition back to something smaller, a flexible contract at a self storage facility can help you do that. Growing your business means taking advantage of every opportunity that is available to you and working hard to make your dreams a reality. If you are looking for a great way to add additional space in a way that is cost effective, a self storage unit might just be your best bet.